Talking poker etiquette, tells, and how not to get popped in @KevinHart4Real's "How to Play Poker." 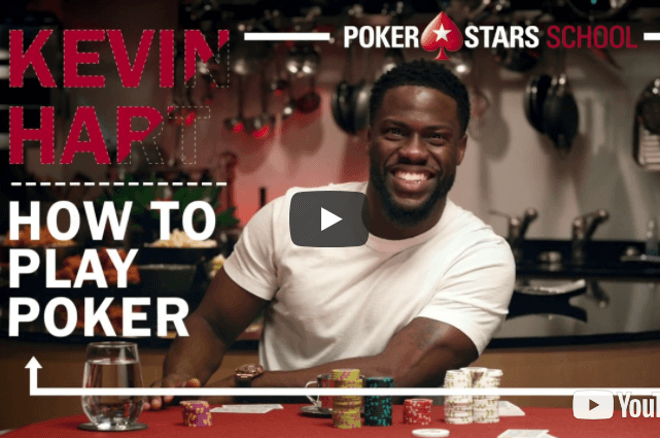 Combining education and entertainment in @KevinHart4Real's "How to Play Poker" series. We've seen Kevin Hart participating in various high roller events for more than a year now. The actor and comedian has provided a lot of fun at the tables in the events he's entered while also allowing non-pros to experience vicariously the daunting task of competing against the world's top players. That's a topic we explored here a while back in "Poker and Comedy: Kevin Hart Among the Super High Rollers." In most games — those not involving Hart, anyway — you'll likely avoid getting popped for committing any of these violations of poker etiquette. Then again, you may risk raising the ire of your fellow players, thereby reducing the enjoyment had both by you and others. Robert Woolley's excellent "Casino Poker for Beginners" series covers all of these same topics and more as part of its comprehensive advice to those new to live poker. Just this week we shared his recommendations regarding "Etiquette When Sharing Space at the Table." Woolley has also covered other basics like the order of play, rules and etiquette regarding poker chips, what it means to "protect your hand" and when to keep your hole cards covered, among other topics useful both to new players and those with experience. Here Hart more specifically addresses how players should work to avoid giving off tells themselves rather than talk about trying to discover others' tells. This is in fact good advice, especially for new players — namely, to focus more on minimizing your own potentially revealing actions than worrying about what tells others might be giving away. Author and PokerNews contributor Zachary Elwood has written multiple books on the subject of tells in poker. In his article "Poker Tell Advice for Beginning Players," Elwood suggests that while new players should focus more on learning basic strategy than reading tells, they also can help themselves a lot if they "concentrate on being as 'unreadable' as possible." Elwood has additionally written here about other behaviors touched on by Hart in the video, including hesitating or looking worried, feigning relaxation as a false tell, and eye contact. The third episode Hart's series covers "How to Bluff" — a timely topic, since being able to sort out when a person is bluffing can potentially help you win a Platinum Pass worth $30,000 in PokerStars' new "Truth or Bluff" promotion — read more about that here.